In current post we are going to see how to install hubot and make it work over XMPP protocol (using open fire server), and how can help us during our daily work. Hubot is a robot which belongs to your chat infrastructure as one more user, which you can talk with him. Hubot can help you automate a lot of tasks, like deploy a site, manage your Pomodoro, or managing issue system to cite a few of them. Hubot is written in CoffeScript on Node.js, keep in mind that Hubot can be extended with CoffeScript and you can easily extend it. This post is written using Ubuntu, so if you are using any other OS, you only have to modify the way of how components are installed. First of all (I assume you have a JVM installed), you must install npm and node.js. For this I have used apt-get. Next step is installing Hubot dependencies by running next apt-get command. 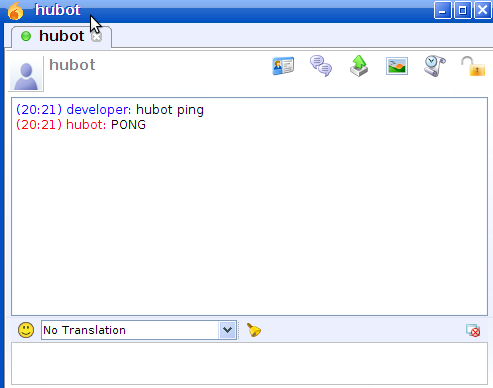 And finally we are going to install Hubot in /opt directory. Obviously could be any other one. and Hubot shell will be started. This shell is really useful for testing purposes but not for production environment. which will produce a Pong message. Now it is time to install Openfire server so we can communicate with Hubot using XMPP protocol instead of shell. Of course you could choose any other XMPP server, but for now Openfire is used. To install it, download it from openfire site, and extract it to /opt directory. Then it is time to configure Openfire server, we are going to use embedded database but of course you can configure an external database such as MySQL or Oracle. Then log in as admin into Openfire and create first two users, developer and hubot. So go to Users/Groups -> Create New User, and fill required information for both users. Next step is creating a room where all users that want to interact with Hubot will join. So go to Group Chat -> Create New Room and create a new room. In our case we are going to call hubot. and finally we must disable TLS security, there is an issue between Openfire TLS version and node.js XMPP module so if you are using Openfire, you should disable it. Next step is checking that developer user has access to hubot chatroom and the account is correctly configured, so we can open our XMPP client (in our case Spark) but should be work with any other one and verify that we can connect. If you are using Spark, log in with developer account and in Actions menu you will find Join Conference room option. Setthere and choose previously created room (hubot). And now you know you have configured correctly XMPP part. Then before starting Hubot, you must install XMPP adapter. Run from hubot directory npm install, and XMPP extension will be installed into hubot. And now we are ready to start using Hubot and Openfire. We are going to start by adding environment variables to configure XMPP adapter. Note that username should be accompanied for server name which in my case is grumpy. And finally it is time to start Hubot. And you will see at Spark your new friend (if you have already add hubot as a friend). And after you check that we can go to hubot-scripts and download and install the useful ones depending on our environment. In next video you could see a screencast of Hubot In Action with some scripts that I use.